Migrants would have to "earn" British citizenship under a points-based system to be proposed by two ministers. Communities Secretary Ruth Kelly and Immigration Minister Liam Byrne will outline ideas for a stronger sense of British and local citizenship. It includes proposals that credit would be given to migrants doing voluntary work but lost for breaking the law. A national day to promote a stronger sense of British identity is also among ideas in a pamphlet out on Wednesday. The pamphlet, A Common Place, calls for a "vital debate" over the coming months about "how to create a fair, effective, transparent and trusted approach" to the idea of earning citizenship. It says next year Britain is introducing an "Australian-style points system" for all migrants outside the EU seeking to work and study in the UK and suggests that "earned citizenship" is a "logical next step". The pamphlet, for the left-of-centre think tank the Fabian Society, says: "Those aspiring to settle and then go on to become full citizens would need to accrue credits." As nobody in Scotland or England cares in the slightest about a British identity what would be the point ? The two ministers suggest the current journey to citizenship is "unclear and could do more to encourage integration". "We suggest a new points-based based system with additional credits required for civic and voluntary work, respect for the rule of law, not just passing a basic English test, but learning more and faster," they say. Such a system would allow credits to be deducted, such as if someone broke the law or spent an extended period of time outside the UK. It would include sanctions for offences including dangerous driving, anti-social behaviour and fly tipping. The two ministers say UK communities need a stronger sense of what they have in common, and they also say the proposed national day would celebrate British values and achievements. Mr Byrne said: "At a time when we face the threat of a new extremism, I just think it's important now for the law-abiding majority to stand up for the values that we've got in common. WHICH EVENT COULD DAY MARK? "One of the ways that we can do that is just taking a bit of time out each year to actually celebrate what we're proudest of in this country." One of the ministers' suggestions is for "good neighbour contracts" setting out rights and duties for all people new to the UK. Young people could receive "citizens' packs" when they come of age, setting out what is expected of adults. These would give information on voter registration, volunteering opportunities and expectations of what they might be asked to undertake, such as jury service. Ms Kelly said the national day could be a new bank holiday. She told BBC Radio 4's Today programme: "The point of it would be to celebrate the contribution that we all make to society." She said it would recognise the "local focus" of people's contribution to society in particular. 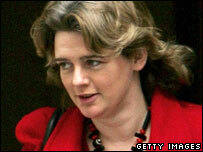 The proposals were dismissed as "gimmicks" by Shadow Home Secretary David Davis. He said: "These issues are largely irrelevant and designed to give the impression action is being taken while entirely missing the real problem. "In any case the government needs to recognise that details matter and explain how these policies would work in practice. "Will a doctor who has completed four years work in the NHS have to be simply lifted off the ward to carry out arbitrary voluntary work in order to gain citizenship?" Prime-minister-in-waiting Gordon Brown has himself previously floated the idea of day to promote the nation's identity. In a speech in 2006, he said it was important the union jack was recaptured from the far-right and that promoting integration had become even more important since the previous year's 7 July London suicide bombings.